We hope the links below will assist you in choosing the right timber for your needs. Note: Adobe Acrobat required. If you have any further questions, please don’t hesitate to ask our expert staff. Timber marking and what consumers should expect. CONDITIONS : Completely protected from the weather and well ventilated. EXAMPLES : Susceptible framing, flooring, furniture and interior joinery. BIOLOGICAL HAZARD : Borers including termites. EXAMPLES : Framing, Flooring and similar, used in dry situations. CONDITIONS : Subject to periodic moderate wetting. BIOLOGICAL HAZARD : Moderate decay fungi, borers and termites. BIOLOGICAL HAZARD : Severe decay fungi, borers and termites. EXAMPLES : Fence posts, garden walls less than 1m high, greenhouses, posts and landscaping timbers. CONDITIONS : Subject to extreme wetting and/or where the critical use requires a higher degree of protection. BIOLOGICAL HAZARD : Very severe decay fungi, borers and termites. EXAMPLES : Retaining walls, piling, house stumps, building poles and cooling tower fill. CONDITIONS : Subject to prolonged immersion in sea water. BIOLOGICAL HAZARD : Marine wood borers and decay fungi. EXAMPLES : Boat hulls, marine piles, jetty cross-bracing, landing steps and similar. Have you ever wondered about the true environmental impact of timber? 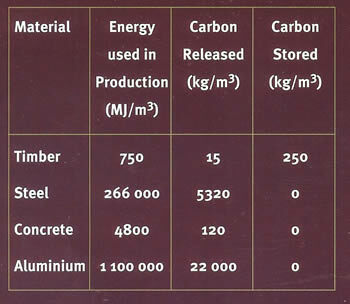 Below is a table summarizing the energy consumed in the production of timber and its three largest competitors. Apart from the fact that Australian Treated Pine sources all its timber from Sustain ably managed pine plantations, when you purchase a piece of treated pine, you are buying a piece of timber that has artificially extended durability, that has to be good for the environment! That’s why we say that “timber preservation is conservation??? It stands to reason that if you buy a piece of timber that has a life expectancy longer than that of any of the native Australian species, you will be ultimately using less timber in the long term. The table below clearly shows that timber consumes less than 35,000% (yes that’s not a misprint!) of the energy used to manufacture the equivalent volume of steel, (lets not even mention Aluminum). You will also note the difference in the carbon footprint (carbon released) and note that timber is the only product available that stores carbon subsequent to manufacture. If you are at all concerned for the environment, your choice should be obvious.